One key takeaway emerges in both the written statement and today’s Q&A: from close to the beginning, Comey believed President Trump was untrustworthy, a bad actor. True or not, that was there in really everything he said, every assumption, every decision he describes making. One can certainly interpret his remarks to mean that he thought Trump was a liar. (“I was honestly concerned that he might lie about the nature of our meeting, so I thought it important to document.“) This comes out just in the fullness of everything Comey said: the immediate decision to start keeping detailed notes, the entirety of the way he described the President, his descriptions of his own reactions in the moment when dealing with the President. They all paint a picture of Trump as dishonest, scheming and predatory. That is Comey’s take and he went out of his way to make that clear. Perhaps the most noteworthy example of this – though not the only one – was going into some depth about how he’d never felt the need to make a contemporaneous record of his dealings with either former President he’d dealt with – one Democrat and one Republican. We’d heard that Comey is a consummate note taker, recording virtually every consequential discussion he has. Apparently not. When it comes to meetings with major political leaders and presidents, this was only for Trump. 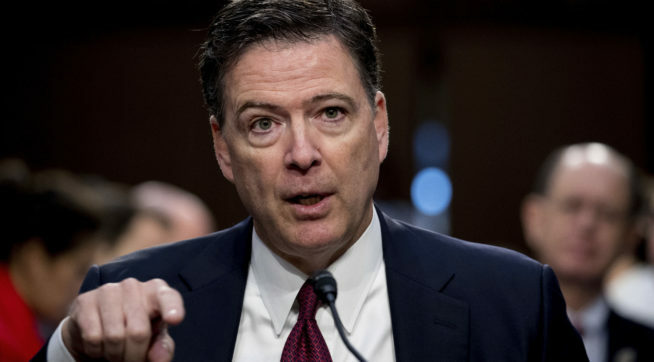 Also highly notable was that while Comey was clear and emphatic about President Trump not being personally a target of the Russia probe, he also made clear – albeit implicitly – that he believes that Trump is now being investigated for obstruction of justice. That’s not hugely surprising, based on what we already knew. But it’s still a very big deal. He marshaled strong evidence that he is correct. And we didn’t know that before. I think it’s possible that this is a reference to the then-unknown but subsequently reported additional meetings with Russian Ambassador Kislyak. In that case, he’s only referring to things we already know or know in their outlines from published reports. But that’s a strained interpretation that is hard to square with the context. It sounds like there’s something else that we don’t know about. That’s another big deal. Less legally significant but still consequential and highly revealing is Comey’s discussion of providing copies of his memos or at least some of them to a friend, a law professor at Columbia University with the express direction to surface them in the press. He went further than this and made clear that he did this with the express intent of forcing the appointment of a special counsel – something indeed happened. This definitely reveals Comey as a skilled and unabashed bureaucratic and press player. But we were naive if we didn’t know that already. Trump supporters will clearly, indeed are seizing on this as discrediting any notion that Comey is somehow pristine and above politics. Though Comey didn’t frame it that way, it’s not unfair to see this as payback for his firing. But a close read of the testimony suggests that Comey thought that his superiors at the Justice Department, certainly Jeff Sessions and (I think he’s saying) Rod Rosenstein were compromised. As I said earlier, I’m not sure it has to be either/or. At the end of the day, I think it all confirmed what we should know. Huge and far ranging cover-ups don’t happen for no reason. Almost invariably they occur because of major wrongdoing. It’s the cover-up not the crime – as I’ve said, that’s almost always wrong. You cover up because you may get away with it and you can’t afford the crime to become fully known. Usually cover-ups work, at least in part. What I think we have here is some major wrongdoing, possibly of various different sorts. That is matched by a President who acts as though the government is something like his own possession, his own company. He acts like it. His lawyer talks like it. Whatever the nature of the original bad acts – which I am assuming occurred based on a lot of information but which we do not know with certainty – the President has managed to stumble into a massive scandal with almost unbelievable speed. As was really clear throughout the campaign, he is predatory, bad-acting and impulsive and even self-destructive in a way that compounds and in some respects makes less effective the underlying malignant behavior. He and his lawyer are in way over their heads and will cause untold damage before this is done, however it ends.